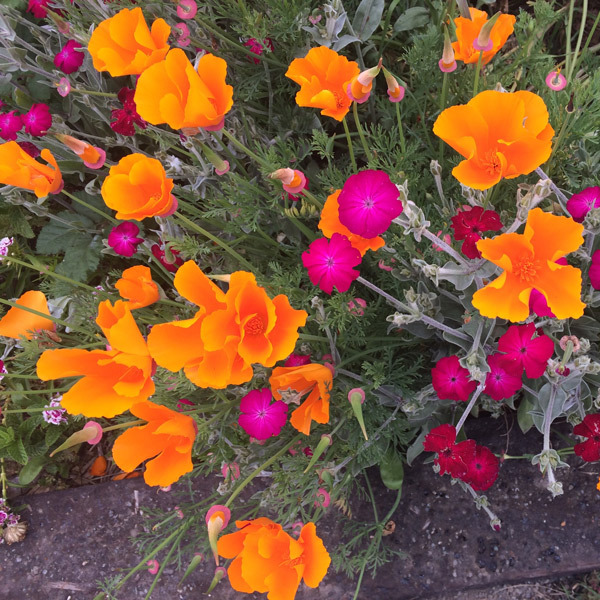 Who isn’t cheered and revitalized at seeing the bouncy orange of California’s state flower along roadsides, field-edge and garden? The vibrancy of color alone is food for the soul. Eschscholzia californica is a native annual that often grows like a perennial in coastal climates. Hundreds of years ago, poppies blanketed the land – an orange that could be spotted from miles offshore. The lanceolate, finely cut, almost blue-green leaves, papery flowers and long deep translucent orange taproot are its medicine. In the wizard of Oz Dorothy, the Lion, Tin man and Scarecrow all fall asleep in a field of Technicolor poppies, eluding to the drug-like effects of the oriental poppy, Papaver somniferum. Our native poppy power has similar, but milder effects, however it is non-addictive and won’t depress the central nervous system. Like the Opium Poppy, California poppy contains a variety of isoquinoline alkaloids including very small amounts of morphine and codeine. While these famous alkaloids may contribute to the activity of Eschscholzia the medicinal properties are likely due to over a dozen other compounds along with flavone glycosides (antioxidant, blood-vessel strengtheners). The flowers have an iridescent sheen and close in dark or wet weather. Petals can be picked and added to foods for flourish and high anti-oxidant content, or made into tea for a mildly relaxing beverage. The foliage contains a watery white sap that is slightly narcotic, and was traditionally used by Native Americans for relieving toothaches, headaches and reducing spasms. The whole plant treats nervous tension, mild anxiety, allergies, insomnia and bed-wetting in children. Poultices can be made for topical treatment of ulcers and sores of the skin.